Because of the web, customer behavior has changed radically over the last 20 years. Sellers have lost knowledge power. Customers can shop, learn, study, and inform themselves online. First, if you “party like it’s 1999,” you are way behind. Look at this chart. Consider how digital tech has radically changed how we shop. 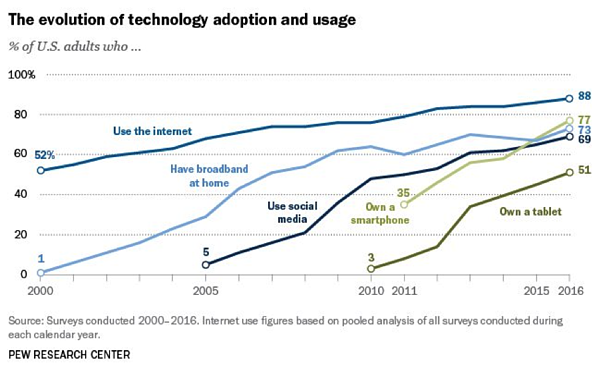 In 2000, nobody had broadband or WiFi internet access at home. In 2005, nobody used social media. The iPhone was not introduced until 2007. In 2010, nobody owned a tablet. Digital web based technology dominates customer consideration. Period. And everyone expects to find what they want, online, immediately. That’s a huge change in customer expectation and access to information. Customers expect to find what you sell, immediately. Another effect of this tech change is, for many business’s, the distinction between marketing and sales has blurred. Humans still buy from humans, but they use digital tools to “know” what they are buying, long before they ever talk to a human in your office. 70% of the decision to buy, has been made before ever contacting your business. Most of the sale is done before they contact your sales person. Think about the last time you bought anything significant. Did you research and comparison shop? How did you do that? How fast did you decide on what to purchase? So your business needs to be very, very good at...digital marketing expertise. A web developer… right? Nope… probably not that. OR...anyone of the other singular digital crafts expertise that exist. You need to be good at all of the crafts that matter to your business strategy. And good means, they all work well together to get specific, measurable bottom line business results. Here at Coombs Marketing we consider ourselves digital marketing and inbound marketing experts. But the very first “craft” that we learned well (long ago!) was video. We successfully sold ourselves as video producers. We knew cameras, and lights, and editing, etc., etc. And everyone knows video is powerful. But we learned something else VERY quickly. Our customers always needed more than video craft. If our prospective video customers first question to us was some version of the basic, “Can I make a video?”, then that customer was going to need much more from us than video craft. They would need us to "think" marketing and sales for them, to ensure that we actually made an effective video. We would have to understand what their business REALLY needed in order to make a good video. So we did that. You can make a video...or you can create a website... or you can "do" social media. These things, at the individual level, are easy to acquire. Lots of people make these elements of digital marketing. But what kind of video or website? For what bottom line business purpose? How will we measure success? How will we improve over time? How will the website work with EVERYTHING else? How will these disparate crafts be combined to create effective revenue generating campaigns? When the expertise is to “make something”... it's NOT to truly serve the bottom line of your business. And certainly not to make decisions about how to integrate with other digital crafts. So good businesses often end up with a mish-mash of disparate crafts that do not serve the bottom line. The website, the videos, the social media, the advertising, and on and on... DO NOT WORK TOGETHER for a specific business purpose. Strategic integration is the essential secret sauce. There is nothing wrong with old school notions like advertising for brand awareness. Branding, advertising, brand awareness are still relevant, but have been widely superseded by the possibility and imperative to get your brand found on Google and elsewhere, when customers are actually looking for what you sell. You need marketers who start by understanding your bottom line, and how potential customers use Search Engines and Optimize (SEO) for that. You need someone who will stay absolutely focused on doing the modern marketing activities that lead directly to getting found online by attracting, converting, closing, and delighting customers. You must focus on building what is, in effect, an automatic “machine” of integrated digital tools, that moves strangers to visitors to leads to customers to promoters, all automatically in your digital assets. 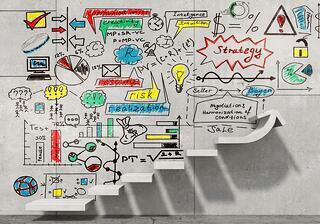 Today, you need an Inbound Marketing expert. Inbound marketing is focused on attracting customers (online) through relevant and helpful content and laser focused keyword advertising. With inbound marketing, potential customers find you through channels like the web, email, blogs, search engines, and social media. So you need expertise in all of it. Old school marketing messaging, AND getting found with SEO, selling online and in-person. You need expertise and judgments and project management. All of digital creative is wide open. The barrier to entry is low. Everything is possible and the sky is the limit… except… because anything is possible, creative choices often simply go wrong, and some techniques are wrong for your business, and some techniques are too expensive for your business. "Gee, that was an entertaining commercial... but what were they selling?" Plus, you can also always get it cheaper. That is a trap too. Wise judgments about what is REALLY possible in YOUR situation, on YOUR budget, need to be made. You need… a really experienced team. Expertise in all digital crafts. And making them work together. Good judgment in business and human nature. Judgment about what crafts to focus on and what will work, at scale. Judgment to set realistic goals and priorities. And real project management ability. Ability to execute. Anything you measure gets better. This kind of marketing is an investment with clear ROI. It is not an expense. It's an essential profit making business activity.